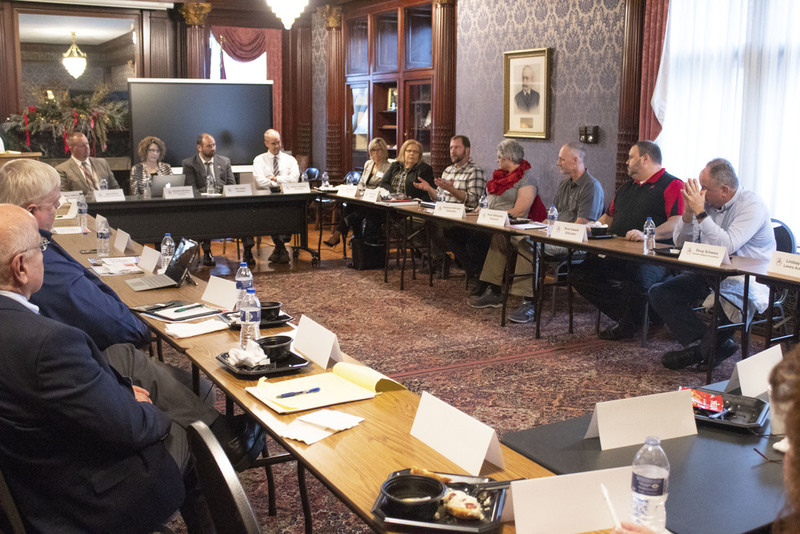 Superintendent Jeffery Talbert hosted a Business Advisory Council for the Alliance City School District on Monday, Nov. 19 at the Glamorgan Castle. Businesses, organizations and ACS teachers and administration were present to discuss the best ways to prepare students for life after graduation. Alliance High School strives to ensure each student graduating is either enrolled in school to further their education, enlisted in a branch of the military or employed following graduation. Dubbed the “three Es,” this goal for AHS will help the students to lead successful and meaningful lives. “We know we have to do a better job of making sure that every last one of our kids when they walk across the stage, they understand what E they are going to whether it’s enrolled, enlisted or employed,” Talbert said. At the first meeting of the business advisory council, it was suggested to have local businesses attend a meeting to provide insight on what they are looking for in employees. This meeting provided a strong consensus about what the employers were looking for. Representatives from Trilogy Plastics, Wally Armour Chrysler Dodge Jeep, Aultman Alliance Hospital, Morgan Engineering and Accent Home Improvement all said they are looking for employees who are drug free, hardworking, dependable and willing to learn and work their way up in the companies. Many companies nowadays cite a lack of motivation and work ethic as a main reason they can’t maintain younger employees. Cell phones and other distractions can lead to injury in many workplaces. The companies are interested in coachable people who are willing to learn and listen when it comes to hiring an employee. After the companies had the chance to speak, the vocational program teachers in attendance had their chance to ask questions. The vocational programs represented were welding by Steve Fuson, health science by Stephanie McKnight, auto mechanics by Kevin Billingsley and construction trades by Brian Swank. McKnight hopes to see more opportunities in the future that will allow the career tech students to hone their skills in the field they are studying. This would not only provide the students with great experience, it would also allow them to see if they would like to pursue a career in that field. It’s not just the students in the career tech program who would benefit from viewing the companies in Alliance and seeing the jobs available, all the students would benefit from seeing all aspects of the industries. There are many jobs within a company that students and teachers do not know about. While a company may be known for manufacturing, there are still office jobs that need to be done in order for the company to thrive. Allowing the students to view those jobs can encourage or inspire them to pursue education in those areas. The companies were interested in setting up a program that would help to inform the students and the teachers about the variety of jobs available within the community. Maintaining local residents is also a major issue the city of Alliance has been facing in recent years. Following graduation, many students elect to attend school elsewhere and many find jobs outside of the community. Showing the students what is available to them within the community right out of high school can encourage them to stay in Alliance. Keeping the students local is a priority for many of the people involved with the business advisory council. The meeting ended with the promise of another one soon to discuss more ways ACS can better prepare students to fit the needs of the local businesses. Many ideas were tossed around during the meeting, which was a first of its kind for the district. “It’s a good start,” said Mark Fedor, president of Morgan Engineering.